Detroit Public School Palmer Park Preparatory Academy’s Pre-K class taught by Anita Ross welcomed special visitors on Monday, November 30. 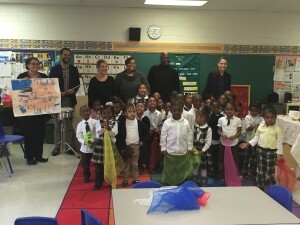 As a thank you to the Detroit Symphony Orchestra (DSO) for welcoming the students and their parents at an installment of their Educational Concert Series in October, the youth presented the DSO’s Assistant Conductor Michelle Merrill, Principal Timpanist Jeremy Epp and “Detroit Performs” Host D.J. Oliver with a special painting created by the students, as well as a performance including their homemade rain sticks. During the visit, Merrill, Epp and Oliver demonstrated various instruments, brought an art project to make with the students, lead a music and movement activity and answer questions from the children. Teacher, Anita Ross’ class attended the series, which introduces metropolitan Detroit youth to the orchestra, due to a grant that allowed the teachers to purchase tickets for $1 per person. While there, students had the opportunity to learn about different families of instruments in the orchestra. Ms. Ross plans on bringing the children to additional installments of the Series this winter. This entry was posted in Info News Center, News and Press Releases, Student Showcase and tagged 152.